December 27, 2018 – January 14, 2019 (including 2 nights in Mumbai) — ONLY TWO SPOTS LEFT! This very special and first of its kind yoga retreat, will take us into our practice like never before. For the 14 days that we will be at this lovely retreat center on Morjim beach in North Goa, we will immerse ourselves in all aspects of yoga sādhana for 6 days a week, with 1 day off on the 7th day of each of the two weeks. Our 2.5 hour morning practice will be comprised of āsana, prānāyām, and meditation, while our evening practice of the same duration will be restorative yoga, yoga philosophy, chanting and meditation. Hali and Kathryn will be drawing upon their decades of experience in both teaching and practicing yoga, to offer you a complete immersion into your own practice that will draw upon several lineages, both ancient and modern: Shivananda Hatha Yoga; Hatha Yoga Vinyasa; Ashtanga Hatha Yoga, as well diving into to the philosophic teachings of jnāna yoga; karma yoga; bhakti yoga and rāja yoga. All of the above mentioned aspects of yoga sādhana are for the same ultimate purpose: to bring about a sense of lightness and balance of body; for the fostering of a clear, and calmly focused mind, and finally, to bring us to a fuller and more profound understanding of ourselves, and the world in which we live. 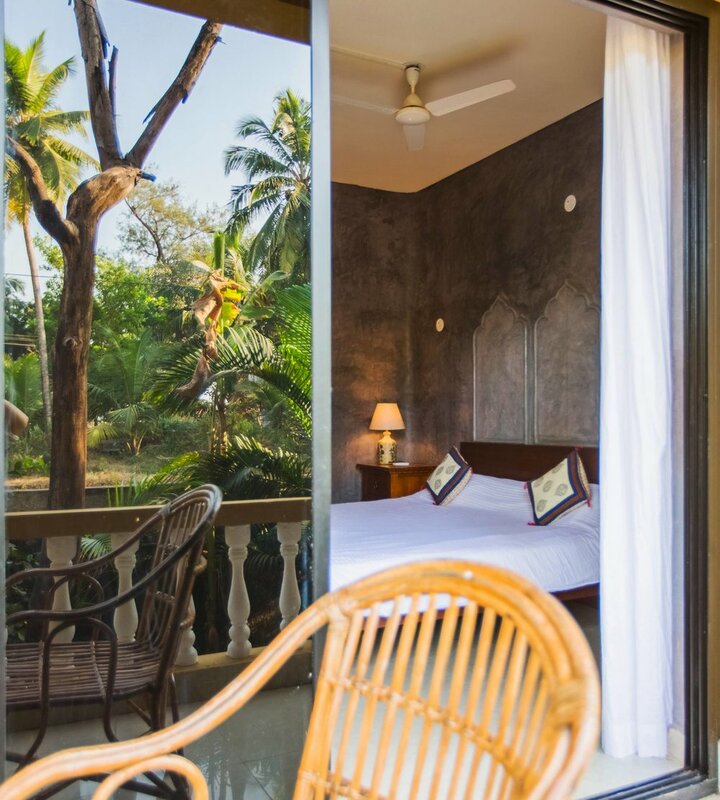 Devarya Wellness (hyperlink) is a peaceful and lovely yoga and wellness retreat center on Morjim beach in North Goa, and is set on a long stretch of sandy beach, close to the charming fishing village of the same name. At Devarya Wellness, you are surrounded by the captivating beauty Goan life and culture, and everywhere you turn, are enraptured by her sublime and abundant natural beauty. "Devarya Wellness is not just a yoga center. It is a healing space that has been designed to guide you on a spiritual path to self discovery. Devarya which translates into Divine Belief in Sanskrit comes from the names of the founder’s children – Dev & Arya – and the entire space reflects a childlike purity. 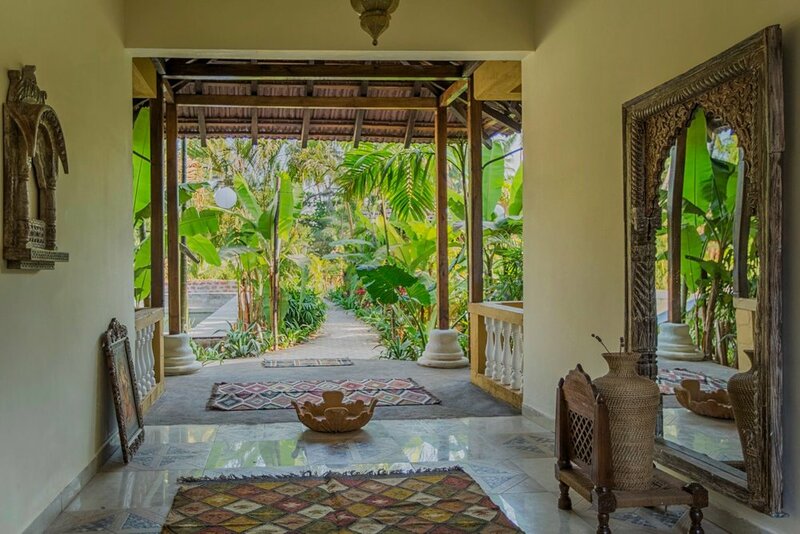 Redefining the experience of a yoga retreat, Devarya Wellness is an oasis of peace where guests can detoxify and cleanse, relax and enjoy the pure magic of yoga in a natural environment." All of the en-suite rooms that we will be staying in at Devarya are named after the chakras, the "spinning wheels" of divine psycho/spiritual energy that reside within all of us. The chakra suites are each decorated in their own unique way, and all of them have their own special flair of unassuming, and charming luxury. Devarya offers two sumptuous vegetarian meals per day - brunch, which is served after morning yoga, and dinner, after evening yoga, and coffee, tea, water and fruit are available throughout the day. Extra day trips and excursions. A $500 non-refundable deposit is required at the time of booking. For our cancellation policy, any further questions or information, or to register, contact me.